You’re always making new memories. So, why not print separate photo album sheets from bonusprint to keep building your photo books? Customising your sheets is simple and fun. And you can order your own designs in just a few clicks. With loose photo album sheets, you can keep creating and customising your photo books whenever you like. You can create a baby book with a loose-leaf photo album, so your photo collection can grow with your little ones. And if you love jet-setting to new places, keep adding your latest adventures as you go. Photo albums with loose-leaf pages also make great hobby books. You can record the progress of a project, make a portfolio or take pictures of your favourite pastime. They’re flexible, fun and easy to customise, so get creating and order yours online. Just like with a photo book, you can customise the layout of your loose photo album sheets any way you like. You have all the same layout options to choose from, and you can print on both sides of each sheet. You can also print your photo book sheets in high-gloss paper to make the colours pop in your pictures. Then when your photo album sheets arrive in the post, you can arrange them in a ring binder and start telling your story. 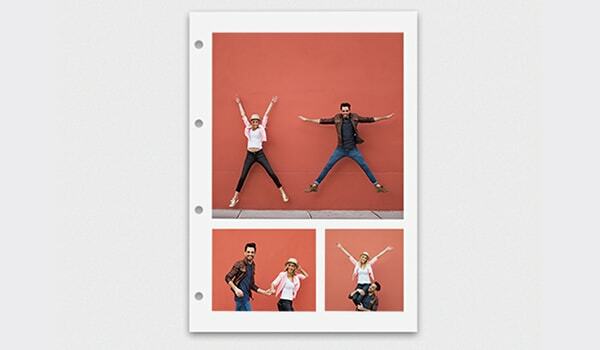 To start your loose leaf photo album, you can order a pack of 24 pages on 12 sheets of high-quality photo paper. And if you download our app for your smartphone or tablet, the next time you’re feeling inspired, you can create new sheets to add to your album wherever you are. To get greater image contrast and depth of colour on your snaps, you can also select high-gloss paper. Then you’re ready to order your prints and have them delivered to your door.